Buy the book that started it all! 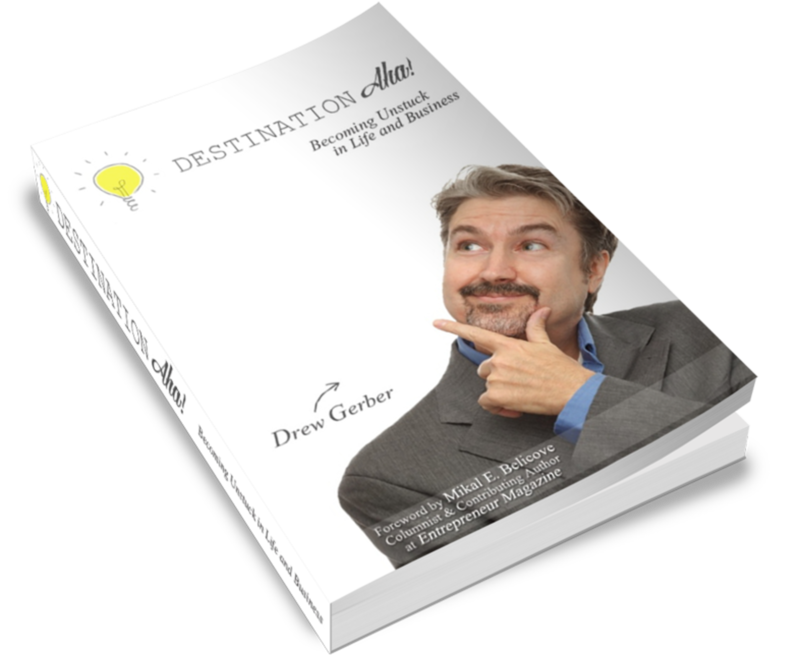 In his entertaining book, Destination Aha! Becoming Unstuck in Life and Business, Drew Gerber takes you from the hot pots of Crestone, Colorado to the not-so-well-marked alleyways of Dubrovnik, Croatia, where he discovers and shares the basic truths about getting yourself un-stuck in both life and business – and how to listen to the universe to avoid that 2 by 4 upside the head! Chemical engineer turned PR whiz Drew Gerber knows that sometimes you can’t think your way, work your way, or avoid your way out of stuckness. He offers fresh, new perspective to get you out of stuck and on to your next aha! Entrepreneurs can’t afford to get stuck! And when they do, they need fast, simple, practical tools to get them out of the quicksand. That the mind is not such a wonderful thing when it’s running around in its own traps – and what to do about it. How to find your life purpose without tea leaves, agonizing soul searching, or yet another costly seminar (Hint: you might find it in Starbucks). When new technological bells and whistles are really the answer – or when that good ol’ additional human resource is a better bet. The keys to a successful, productive, satisfying business that gives back to you as much as it takes out of you! Grab your copy today to begin a life of ever-expanding ahas!